They will shortly pay for themselves. Yes, the initial outlay for the boards themselves and the associated software will not be inexpensive, but the investment will quickly pay for itself. 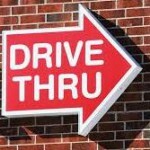 That’s because survey after survey reveals that revenues at the drive-thru lane will typically increase by from six to eight percent, once the signs are employed to their full potential. Faster throughput. With digital signage, you can change your message with a click of the keyboard, and that means you can present a smaller, more focused message to your customers, based on the time of day, the day of the week, and even on the weather. With less verbiage to wade through, your customers can make their decisions faster, and not only do you process customers faster, but also the customer spends less time waiting for his food, and he has more time to enjoy it. He leaves happier, which also means he’ll return more often – a double win for you. Keyed into your POS system, and when you make a change in an item’s price simply and easily via smartphone or laptop, it gets transmitted not only to the digital signs but also to the POS system. So, you’ve already eliminated the time consuming and the possibly treacherous job of changing a printed sign, and now you’re also free of the separate task of updating the POS, as well as the possibility of error, or of one of your employees falling off a ladder when changing the sign.